Race into holiday excitement with Mario! 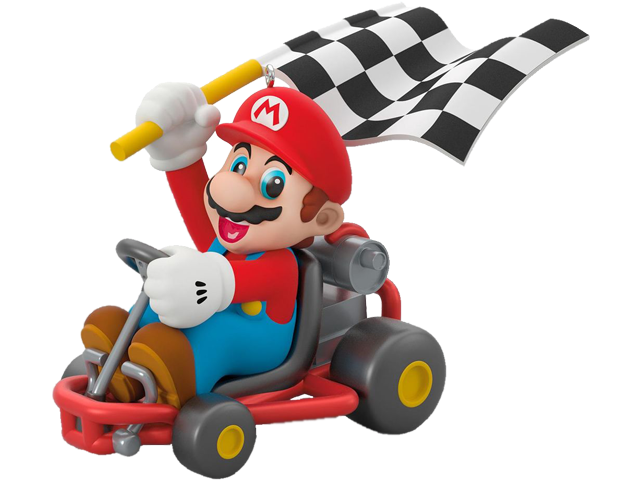 Gamers of all ages will feel like they've taken the checkered flag when they receive this Christmas tree ornament that features a victorious Mario at the wheel of his go-kart from the racing video game that has been a go-to source of fun for more than two decades. It's Mario time! Artist crafted by Orville Wilson, this Christmas tree ornament features wheels that turn. Pre-packaged in a box for easy gift giving, preservation and storage. Dated 2018 in copyright. Plastic Christmas tree ornament is lead-free and measures 3.9" W x 2.5" H x 1.9" D.